Just out of college and completely alone in the world, Maggie Montgomery has one shot left to save her life from an abyss of poverty and hopelessness. Clinging to the last shred of fuel and hope, she arrives at the mansion of Texas billionaire Conrad Ayers. Although Maggie is clearly not what Mr. Ayers and his wife have in mind for a nanny, they agree to hire her temporarily until they can find someone more appropriate to fill the position. However, Maggie's whole world is about to be up-ended by two way-over-scheduled children and one incredibly handsome hired hand. As she struggles to fit into a world she was never made to fit in, Maggie wonders if she can ever learn to become a perfect version of herself so she can keep the job, or is she doomed to always be searching for a life she can never quite grasp? Keith Ayers despises his life. As the son of Texas billionaire Conrad Ayers and the fiance to a Senator from Texas' daughter, it looks great on the outside, but inside, he is dying. He would vastly prefer to manage and train his father's racehorses. However, everyone else thinks that is beneath him. He needs to get into industry and build on his father's success. Suffocating under the constrictions of his life, he meets Maggie who begins to teach him that wealth and power is not everything in this life. 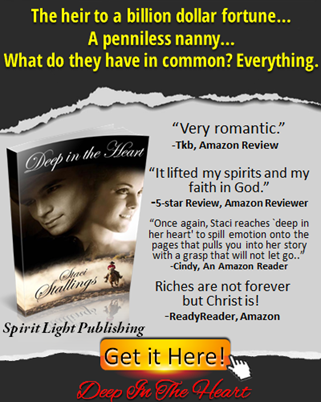 But can Keith defy the most powerful men in Texas to follow his heart?. It was stupid. Keith knew it, but the quieter the house got, the more he wanted to check, just one time. They were already in bed, probably asleep, and yet, he wanted to make sure of that. Finally, unable to talk himself out of it, he quietly exited his room on the far opposite side of the mansion. He shook his head as he crossed past the master suite. How very far it seemed from the kids’ rooms. Not for the first time ever, he wondered why they bothered to have Pete and Izzy in the first place. Little trophies. That’s all they had ever really been. It was just like Ike said. Kids were meant to live with their parents, not be put on display to make the parents look good. Shaking his head to clear it of the disturbing thoughts, Keith made his way to the three doors at the far end of the hall. He noticed without really looking that the light was on under her door. She was probably reading or getting ready for bed. He’d have to be extra quiet. On his way to Isabella’s door, however, he noticed the white door on the opposite side cracked open. That was strange. Curious, he stepped over to it and peeked inside. The scene beyond knocked sanity and air from him simultaneously. There, on her knees, next to Peter’s bed knelt Maggie. He couldn’t see her face, but her back was arched. She was huddled in the protectiveness of her shoulders. Next to her, Peter lay, eyes closed, but turned toward her. Unbidden tears sprang into Keith’s heart as he watched. “Amen.” Peter’s eyes opened, and he smiled at Maggie. Just then he glanced up, and Keith knew he was busted. He sniffed self-consciously. The quiet peace of the scene traced over Keith as he watched her tuck the covers in around Pete. She was going to make a marvelous mother someday. “Good night, sweet prince.” She kissed the tips of two of her fingers and pressed them onto Peter’s forehead. “Now go to sleep.” Gently she drifted her fingers over his face and down the sides of his nose. With a sigh, he settled down and soft peace came over his little face. Maggie turned back to the door and walked all the way to it and through it without stopping. Keith let her pass and then closed the door and stood watching her in the hallway. If he could’ve thought of something to say that would’ve kept her there, he would’ve said it. However, for some reason his brain wasn’t cooperating with his mouth. “Well, ‘night.” She turned, opened her door, and stepped inside. And then she was gone. Keith closed his eyes and shook his head. Why she had this effect on him, he couldn’t clearly tell. This was completely crazy. He was, after all, engaged to be married. Engaged. That meant you weren’t up at all hours of the night, standing in darkened hallways with some woman in her pajamas. He needed to call Dallas if for no other reason than to douse the guilt slashing its way through him. Okay, there are certain things in this life a girl just shouldn’t have to deal with. Changing flat tires for instance. Radiators overheating, yes. A busted pipe. Programming the remote control. But being blindsided like that wasn’t fair at all. When the door closed between them, Maggie forced herself to breathe in a deep inhale. It did nothing at all to stop the swimming of her thoughts or the racing of her heart, but at that point anything was worth a try. Showing up in the kitchen at breakfast for no reason was one thing. Showing up when she was in her oldest pajamas with the rip on one side was quite another. Her hand went up to her hair, and she raked her fingers through it extra hard. There was no telling how she looked, but how he looked? Wow, was he easy on the eyes. Not to even mention how heart-stoppingly handsome he was minus the hat and the bandana. Dark hair, cropped extra short, and that face, and that smile. Ugh. It just wasn’t fair. 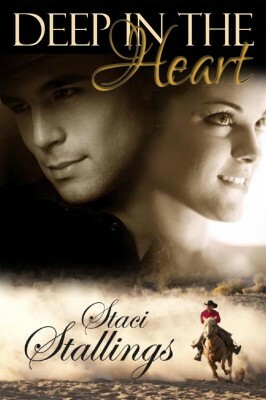 I call this book a “Christian romance”, but it was so much more. The book dealt with many life issues with grace and forgiveness. We could all take lessons from this author on how best to handle the difficult situations in our lives. Even though the book dealt with difficult issues, it still managed to be upbeat and a “feel good” book after you finish reading it. If you enjoy reading Christian books, I highly recommend this one!